I love Whole Foods, but I don’t shop there very often for a couple of reasons. Number one their food is expensive and number two I ALWAYS buy more than I intended to. I guess it’s because it looks so damn good. I have to admit they do a great job making everything look so appealing. The one item I love is their olives. They have a huge selection and some that are a bit difficult to find in other stores. Again, I don’t but them very often because they are $9.99 a pound, but I am baking pizza Sunday for a party and I want some of these super green olives. 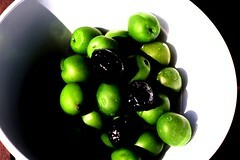 I don’t even know the correct name of the olives, but I just love them. I did tinker with the shot so they are greener in the photograph.